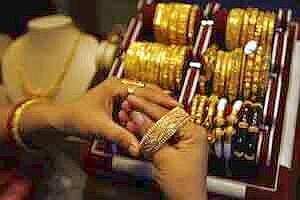 Mumbai: Gold prices in India, the world’s top buyer, edged higher on Tuesday on a weak rupee and recovery in the world market, although the upside further discouraged buying, dealers said. The most-active February gold contract on the Multi Commodity Exchange was 0.31% higher at ₹ 27,777 per 10 grams by 4:58pm. The contract had fallen 5.6% since the beginning of the month. Many Indians avoid buying gold during Khar Mass from 16 December 2011 to 14 January, 2012 as they consider the period inauspicious. International spot gold prices rose in Europe on Tuesday as the euro strengthened versus the dollar, but gains were capped by concerns that policymakers’ efforts to address the euro zone debt crisis are falling short and could keep European assets under pressure. The rupee, which plays an important role in determining the landed cost of the dollar-quoted yellow metal, weakened early on Tuesday due to fragile global sentiment after the death of North Korea leader Kim Jong-il raised fears of regional Instability. A Reuters poll of 20 hedge fund managers, economists and traders showed expectations for international spot gold prices to fall below $1,500 an ounce over the next three months and they are unlikely to retest September’s all-time highs until later 2012 at the earliest.